Creating fabulous landscape by Washi paper is the aim of this research project. 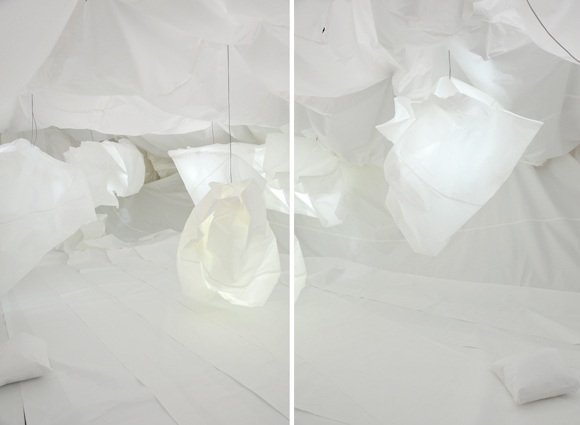 The specific attributes of paper its transparency, lightness and a subtleness helps to make a narrative landscape. This installation is an imaginary space where time slows down and is altered, allowing physical and psychical narratives to blend and merge with the viewer's individual experience and memory. It encourages a shift in consciousness and creates compelling possible worlds. By immersing yourself in this artwork it opens up imaginary realms where narratives blend and merge, transporting you into the curious worlds of sound, light and imagery. Traditionaly Washi is represented purely as a functional material used within Japanese culture. My aim is also to release this traditional aspect and project a more diversified perspective as an art material.